grandma's cookie jar: Don't Miss the "Wonderful"! 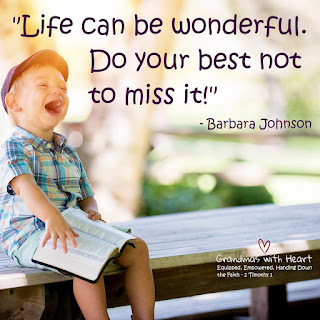 Life can be wonderful! Watch for moments of joy each day in your life and help your grandchildren learn to do the same! If we set the example of being joyful people who are thankful for our blessings and who laugh, our grandchildren will be able to see what it looks like to live the same way. Life is a gift from God. Yes, there are difficult times, but there is also joy and wonderful moments. Look for them. Be quick to share with your grandchildren the blessings and joy you experience. Live in a way, so when your grandchildren think about joy and thankfulness, they think of you.